Wind turbines use different control methods to adjust the total power input according to the operating conditions. One way to archive this goal is to adjust the rotor blade angle according to the wind – a procedure known as pitch control. This allows the control of the turbine speed and thus the power output, but it may also act as a brake, stopping the rotor by turning the blades. Moreover, pitch control has a key role in reducing fatigue loads on the turbine structures thus protecting the turbine from overload. However, the design of existing systems is often too complicated to be employed in small turbine systems. The aim of this invention was to create an efficient and uncomplicated mechanism for controlling the blade adjustment from inside the hub, whereby the hub is small and of simple design. The adjustment of the rotor blades is performed by an axial displacement of a shaft in the rotor axis. Therefore the shaft provides a groove for each rotor blade that is located eccentrically, and parallel to the blade axis within the rotor blade. 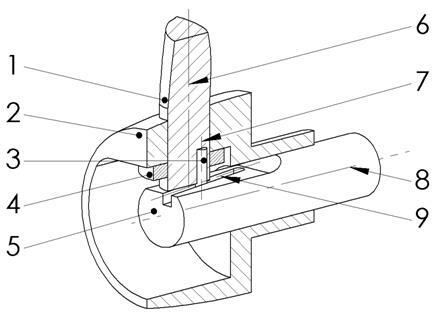 This way it is possible to adjust the blade pitch depending on the axial position of the shaft.